EASY HANDLING - We put a 2nd grip on our boat hook for easier handling with either 1 or 2 hands. Use your forearm as leverage if grabbing a dock with 1 hand or have a more comfortable spot if you are using 2 hands on the hook. THE REACH YOU NEED - With a 3 part telescopic hook you can reach as far as 12 feet, while stowing in just 4.5ft. MULTIPURPOSE - Push, Pull, Scrub. This boat hook does whatever you need it to. With a universal threaded tip, you can put a brush on it for easy scrubbing of your boat. With the orange tip, go ahead and push off other boats or the dock without worrying about damage. The hook can be used for picking up things that have fallen in the water, grabbing lines, grabbing the dock. 1 Hook all your needs. FLOATING - Things fall in the water, luckily for you, this pole will float even when you do accidentally drop it in the drink. LIFETIME GUARANTEE - Unlike most of our competitors we believe in what we produce. Because of this we offer a lifetime guarantee on the hook portion of this boat hook. Why do we do this? 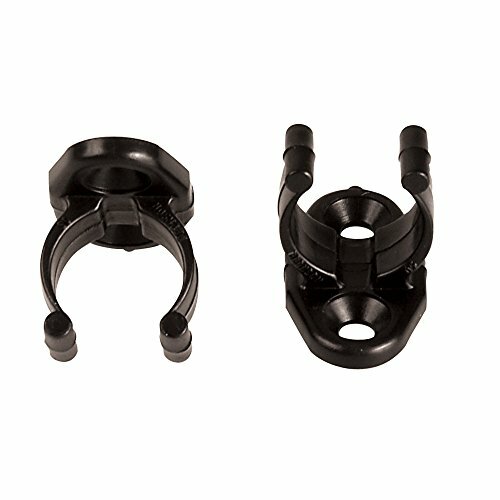 We make the hook with a glass reinforced nylon, so while our competitors hooks will bend and snap, ours will hold fast. 100% RISK-FREE SATISFACTION GUARANTEE - Buy with confidence! With our 100% risk-free satisfaction guarantee you can rest assured you will be refunded if our Boat Hook doesn't suit your needs. Although, we are confident you will be super impressed with its sturdy, lightweight, high-quality design. If you want to dock/undock with ease, this is the perfect boat hook for you. 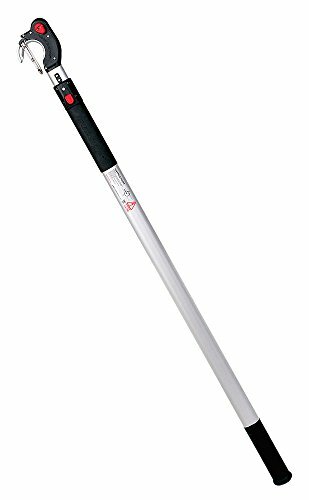 Boat Hook: High quality, built to last Lightweight design floats in water Twist onto any standard acme threaded 3/4" pole tip Works with Eversprout poles & common threaded broom, sweeper, painter, extension poles Scratch-Resistant Design so you don't damage your beauty Great value 100% risk-free satisfaction guarantee you can rest assured you will be refunded if your boat hook doesn't suit your needs. 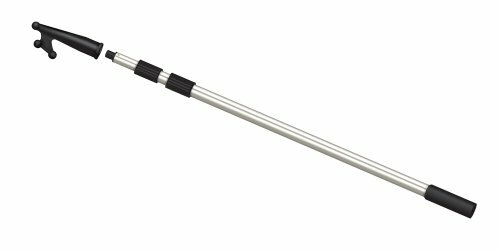 -Does Boat Hook Attachment fit onto any pole? The Boat Hook fits onto any regular acme threaded pole. Any Eversprout pole works. Most threaded broom/sweeper poles, painter poles, mop poles, and extension poles work. -Can Boat Hook "click" onto a pole? -Does Boat Hook come with a pole? No, but it fits any standard threaded pole. 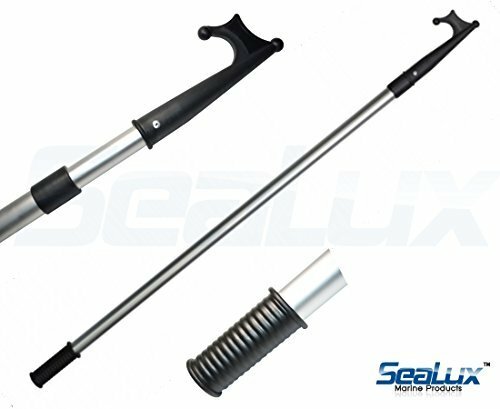 We also sell the Boat Hook with our Extension Pole as a combo unit. 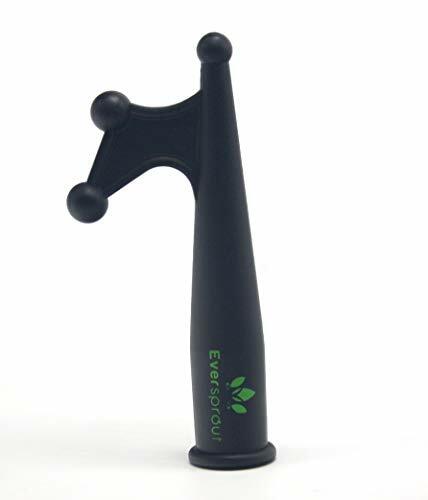 TWIST-ON DESIGN - Easily and securely attaches to the Eversprout Extension Pole or any standard US (3/4 ACME) threaded pole tip - Eversprout poles, common threaded poles like mop, sweeper, painter - Just twist on your boat hook and you're ready to go! FLOATS - attachment floats by itself. Will float with Eversprout Extension Pole. Other poles may or may not float. 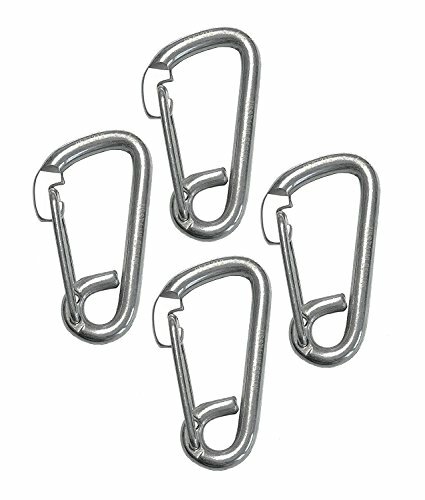 This is for four (4) quality marine grade stainless steel (AISI 316) spring hooks 1/4". Each spring hook is stamped 316 and laser etched 1/4" with the makers mark. The spring hooks are marked in the US specification style of 1/4". The Metric equivalent is generally considered to be 6mm. Not to be used for overhead lifting. AISI 316 stainless is a premium grade of stainless and is considered by many to be best in class. 316 stainless is corrosion resistant and very durable even in the harshest of conditions. Your new boat hook will allow you to reach out and grab onto the oncoming dock, fallen mooring line, or any item that may have fallen into the water. 2-section: Length: Extendable from 4' (48") to 7'2" (86") Tube Size: 1" and 1-1/8" Material: Anodized Aluminium tubing, fiber reinforced nylon hook hook. 3-section: Length: Extendable from 3'6" (42") to 8'7" (103") Tube Size: 1", 1-1/8" and 1-1/4" Material: Anodized Aluminium tubing, fiber reinforced nylon hook hook. 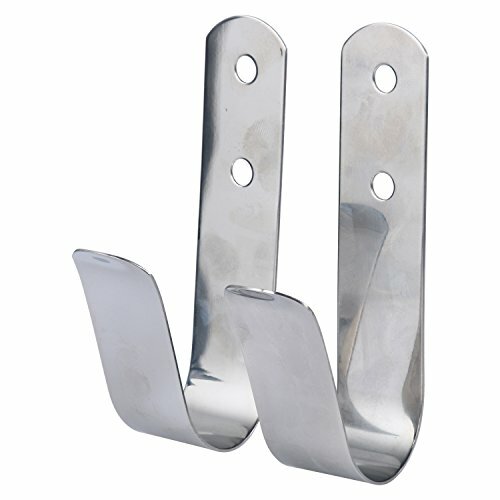 Boat hooks like this have a multitude of uses and are indispensable on any small boat. Whether its helping you take up a mooring or catching a line from the water a boat hook is an invaluable piece of kit. Ridged rubber grips at the base of the boat hooks help prevent slippage when in use. 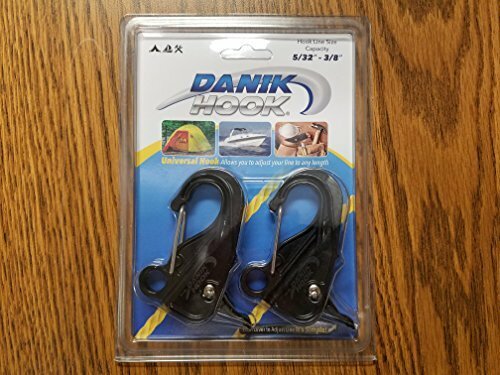 two and three section telescoping boat hooks are made of anodized aluminum tubing, a fiber reinforced nylon hook, and a soft tip to help prevent scratches. These deluxe telescoping boat hooks feature a twist lock mechanism that helps hold the hook at the desired length. Extendable boat hook used for grabbing lines etc. Dual purpose end with hook for pulling and blunt nose for pushing. 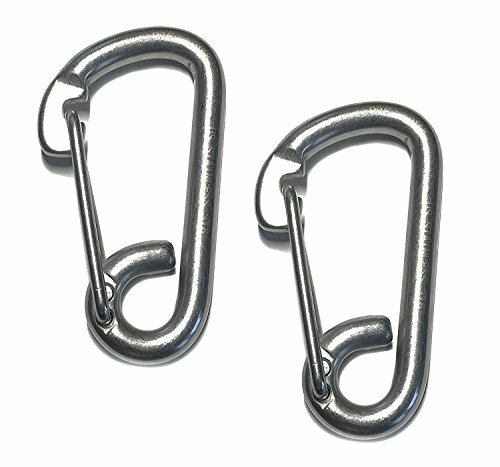 This is for two (2) quality marine grade stainless steel (AISI 316) spring hooks 3/8". Each spring hook is stamped 316 and laser etched 3/8" with the makers mark. The spring hooks are marked in the US specification style of 3/8". The Metric equivalent is generally considered to be 10mm. Not to be used for overhead lifting. AISI 316 stainless is a premium grade of stainless and is considered by many to be best in class. 316 stainless is corrosion resistant and very durable even in the harshest of conditions. wRino Boat Hook Onboard Docking & Mooring System:: for Quick and Easy Docking Safely from Your Boat :: NMMA Innovation Award Winner. Simple and easy way to dock from onboard by using the fastest method for attaching lines, LASSOING . Attach and retreive dock-lines from cleats, pylons, dock-rings and buoys from the safety of your boat. This is for two (2) quality marine grade stainless steel (AISI 316) spring hooks forged 1/4". Each spring hook is laser etched 316 with the makers mark. The forged spring hooks are made in the US specification style of 1/4". The Metric equivalent is generally considered to be 6mm. Not to be used for overhead lifting. AISI 316 stainless is a premium grade of stainless and is considered by many to be best in class. 316 stainless is corrosion resistant and very durable even in the harshest of conditions. A unique innovation. The Hook & Moor boats hook helps you thread a mooring rope through a mooring ring with a simple pull or push. Always ready to use. No loading, messenger or guide lines. Use the your real mooring line directly. Works as an ordinary boat hook when the hook head is in its locked position. Made of glass fibre reinforced PA, forged aluminum and stainless steel. 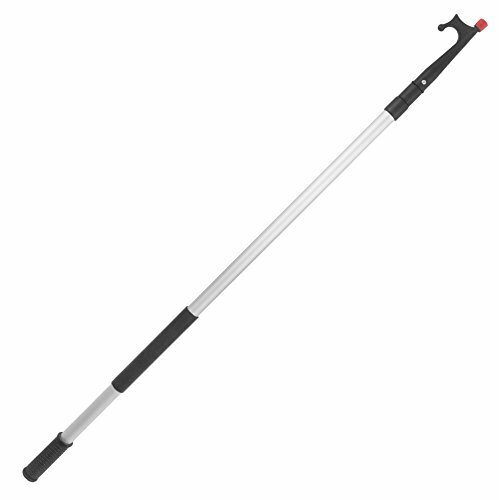 The telescopic versions becomes only 115 cm in length when folded. Compared to traditional hooks, the patented Hook & Moor provides superior functionality when mooring. It eliminates the risk of going overboard when mooring the boat and you will no longer need outside assistance when anchoring or docking. It brings your mooring rope through the ring and back onto the boat in one motion. Just a simple push or pull. Use your own mooring line. No messenger line needed. You can stay onboard. It also works as a regular boat hook when the hook head is locked open. And if accidently dropped in water, it floats. The Hook & Moor boat hook helps thread lines through hard-to-reach mooring balls and post rings. Always ready, it allows the use of the boat's own mooring line for direct one step tie-ups without using a messenger or guide-line. It also works as a regular boat hook when the hook's head is in the locked position. The benefit of the Hook & Moor boat hook is that it pulls the mooring rope through the ring and back onto the boat in one motion without having to reach dangerously far overboard. Just place the eye of the dock line in the carabiner of the Hook & Moor, reach down and pull the hook right through the cleat or mooring eye and bring the dock line back towards the boat to secure the line's eye on the cleat. Step by step 1. Release carabiner 2. Place Eye of dockline in the carabiner. The quick release Carabiner quick gate opens out. The function is to prevent the carabiner from accidentally hooking on to a mooring ring. 3. Choose push or pull operation according to mooring situation. 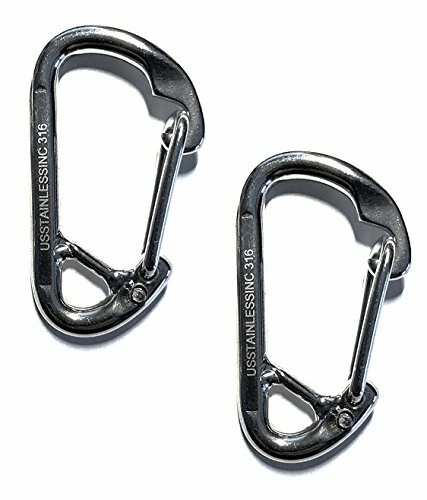 Carabiner must always point in opposite direction from hook mooring movement. Use the mooring line to control this. 4. When operation is completed pull out the dock line from the carabiner and secure the line's eye on the boats own cleat. Hook & Moor provides superior functionality when mooring. It eliminates the risk of going overboard when mooring the boat and you will no longer need outside assistance when anchoring or docking. It brings your mooring rope through the ring and back onto the boat in one motion. Just a simple push or pull. Use your own mooring line. No messenger line needed. You can stay onboard. It also works as a regular boat hook when the hook head is locked open. And if accidently dropped in water, it floats. The line slides freely when holding the lever down. When released, the unique mechanism grips the line securely. For pole diameters up to 1-1/2". 2 per package. For pole diameters up to 1-1/2. 2 per package. Non-conductive non-magnetic and non-corrosive. Ideal for storing boat hooks mops gaffs flashlights tools etc. All sizes use 1/8" holes on 3/4" centers. Color: black. Sold in pairs.